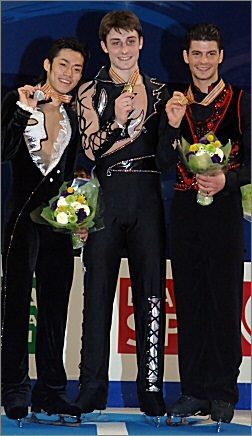 Brian Joubert of France (middle) won the gold medal at the 2007 World Figure Skating Championships. Daisuke Takahashi of Japan (left) captured the silver, while Stephanie Lambiel (right) of Switzerland won bronze. The 2007 ISU World Figure Skating Championships continued Thursday with the Men’s Free Skate. Brian Joubert of France won his first world title, while Japan’s Daisuke Takahashi won the silver. The bronze went to last year’s world champion, Stephane Lambiel of Switzerland. Takahashi who stood in third after the short, placed first in the long with 163.44 points, moving up to second overall with 237.95 points. Takahashi performed a compelling program to Phantom of the Opera that built in intensity as it progressed. The Grand Prix Final silver medalist put a hand down on his opening quadruple toe loop, but then he collected himself and executed a beautiful triple Axel followed by another one in combination with a double toe loop. Following his level 4 upright combination spin, was a dynamic level 3 circular footwork sequence which flowed and fit the music perfectly. With the crowd cheering, the Japanese Champion completed a triple flip-triple toe loop combination, a triple Lutz-double toe loop-double loop combination, and three more triple jumps – all of which received bonus points for being done after the ½ way mark of the program. He had a small bobble on the landing of his level 3 flying upright spin and was awarded just the base mark. The cheering of the audience rose to a roar as Takahashi started his level 3 straight line footwork sequence that involved his whole body in the interpretation of the music. He finished his fast level 3 combination spin to a standing ovation that had him sobbing with relief and joy. Takahashi was proud to be the first Japanese man in history to win a World silver medal. Lambiel rose from sixth place after the short to third overall (233.35 points) after placing second in the long program with 160.65 points. The Swiss Champion displayed his recently renewed love of skating with his passionate performance to Flamenco music. He opened his program with the two jumps that eluded him yesterday in the short program – a triple Axel and quadruple toe loop (in combination with a double toe loop-double toe loop) – and then a beautiful triple loop and double Axel. Both of Lambiel’s level 3 circular and straight line footwork reflected the driving beat of the music. The rest of his jumps were performed after the ½ point of the program which included another quadruple toe loop (with a hand down and step-out), a triple Lutz-triple toe loop combination and a triple Salchow. A wonderful flying sit spin showed off his beautiful positions and was graded level 4 and the 2006 Olympic silver medalist concluded his program with another combination spin that ended in a fast headless position and which had the crowd rising to their feet. The 21-year-old felt it was important to skate a good long program. “I think the most important thing for me was the performance, and you could see that the fight was hard,” said Lambiel. “But it was really nice to fight here. Maybe nobody thought after the short program that Lambiel comes back, but I was ready. I was there” and I was really happy to be here participating in this World Championships, and I did my best. Lambiel, who sat out the European Championships, explained that after winning an Olympic medal and two world titles, he had to evaluate what he really wanted in skating. Lambiel plans to continue skating next season, but says he needs to find a way to juggle skating with studying. Overnight leader Joubert finished third in the long with 157.21 points, but with a total score of 240.85, was able to maintain first overall. Joubert skated an exciting program to a Metallica medley, opening with a quadruple toe loop, followed by a triple flip and a triple Axel. The European Champion followed up with a level 3 circular footwork which accented the beat of the music and was awarded +GOE and a fast level 4 back sit change sit spin. After the ½ way point, he executed a triple toe loop-triple toe loop combination, a triple loop-double toe loop-double toe loop combination, a triple flip-double toe loop combination and a triple Lutz. Joubert admitted to being very tired and waiting for the scores was torture. Joubert is already thinking of next season. “I have some ideas for new programs,” he shared. “I am thinking about the Olympics also; we have to be ready for this. Tomas Verner of the Czech Republic, who was ninth after the short, came in fourth overall (226.25 points) after placing fourth in the long with a new personal best of 155.80 points. The European silver medalist exhibited excellent skating skills and high jumps with beautiful air position in his program to Requiem for a Dream. A flurry of gorgeous jumps opened the program: quadruple toe loop-triple toe loop combination, a quadruple toe loop, a triple Lutz, a triple Salchow, and a triple Lutz-double toe loop-double loop combination, and a triple loop – all of which received +GOE and was only interrupted by a level 4 flying sit spin. Verner also executed a level 3 change foot combination spin that was award +GOE, a level 3 circular footwork that flowed with the music, a level 4 sit spin, and a straight line footwork sequence which had the audience clapping and that built in intensity as the music swelled. The only error came when he stepped out of the landing of a triple flip, putting his hands down. “I was so surprised about my technical score – over 84 points,” said Verner. “I didn’t expect that because I knew that I was tired and my spins were weaker than usual. But the two quads were there and [most of the other] jumps as well. USA’s Evan Lysacek finished fifth in the long (148.69 points) and overall (222.18). Dramatic opening moves set the tone for Lysacek’s program to Carmen. Skating with an intense determination, the US Champion landed a quadruple toe loop-double toe loop combination (with a turnout on the quad). The triple Axel which followed was not pretty, but clean, and he landed six more triple jumps – two of which were in combination. Lysacek also produced two level 3 footwork sequences, using the dramatic music to it’s fullest, as well as two very good combination spins which had excellent positions. The US Champion hasn’t given too much thought to future plans yet. Nobunari Oda of Japan, who stood in 14th after the short, placed sixth in the long (142.77 points) and catapulted to seventh overall (209.94 points). The Japanese silver medalist opened his routine to music from the Mission Impossible soundtrack with a triple Axel-triple toe loop-triple loop combination, a double Axel, and a triple Salchow-double toe loop combination. The 19-year-old also produced a level 2 circular and level 3 straight line footwork sequence which interpreted the music beautifully, as well as two more double Axels and a triple lutz-double toe combination (which was not counted as it was a fourth combination). Kristoffer Berntsson of Sweden, who stood in 15th after the short, placed seventh in the long with a new personal best of 140.20 points, placing ninth overall (206.29). The 2007 Nordics Champion excited the crowd with his upbeat routine to Saturday Night Fever, Studio 54, and Boogie Wonderland, executing seven triple jumps which included a triple Axel-triple toe loop combination. He also produced three level 4 spins while entertaining the crowd with level 3 circular and straight line footwork. Jeffrey Buttle of Canada slipped from second after the short to sixth overall (214.96 points) after placing eighth in the long program with 135.06 points. The Four Continents silver medalist stepped out of a triple Axel and fell on a quadruple toe loop (downgraded to a triple) as well as his first triple Axel. Despite the mistakes, he otherwise produced five more triple jumps and didn’t disappoint with intricate and expressive level 3 footwork and good spins in his routine to music from the soundtrack Ararat. USA’s Johnny Weir put out an expressive routine to Child of Nazareth, opening with a good triple Axel-triple toe loop combination, a triple toe loop, and a triple Lutz-double toe loop combination. However, the 22-year-old only landed two more triple jumps, doubling both a planned triple Axel and triple loop, as well as singling a planned double Axel. His footwork was only graded a level 1 for the circular and level 2 for the straight line. His spins, however, were well done showing excellent speed and positions. The US bronze medalist earned 132.71 points for a tenth place finish in the long, slipping from fourth to eighth place overall with 206.97 points. Stefan Lindemann of Germany, who stood in 16th after the short, placed ninth in the long with a new personal best of 133.38 points and 12th overall (198.78 points). Sergei Davydov of Belarus slipped from eighth to tenth overall, while France’s Alban Preaubert finished 11th. Christopher Mabee of Canada, who stood in seventh after the short, placed 14th in the long and overall. It wasn’t his best performance, but the Canadian silver medalist felt that just competing at his first world championships was a step towards where he wants to be.